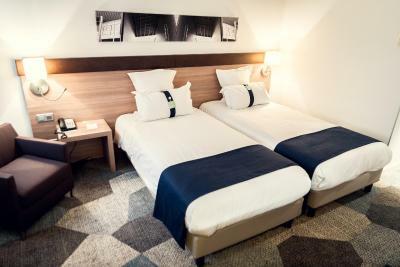 Lock in a great price for Holiday Inn Mulhouse – rated 8 by recent guests! Had the pool almost to ourselves. Room was clean and the shower was very strong. The rooms were clean, beds were fine. Kettle in room. Sauna and steam room and pool were good - Once they got them working. The location was good for travelling-on. Perfect location. Close enough to city centre. Plenty of food outlets nearby. Easy access to major routes. Underground car park is not cheap but is excellent idea! Convenient location for where I work, and well connected through buses and trams. It is very comfortable, the spa is a very nice touch, and the room service is quite good. The staff is nice and friendly, and the amenities are this close to be very good. Je suis très decu en générale, la seule chose que j'ai apprecié même si c'est cher c'est le resto et son personnel tres serviable et sympa, des plats coieux. Suite vraiment grande, luxueuse, bien équipée, très calme, literie au top. Mooi hotel, met verzorgde kamers en goed ontbijt en uitgerust met een goed restaurant. Petit déjeuner varié proposant de multiples choix. Propreté des locaux et accès facile et gratuit à l'espace détente. Très bon accueil, l'espace piscine, sauna et hammam au top. La température de l'eau de la piscine est juste excellente. La chambre très propre, on y retournera sans hesiter. 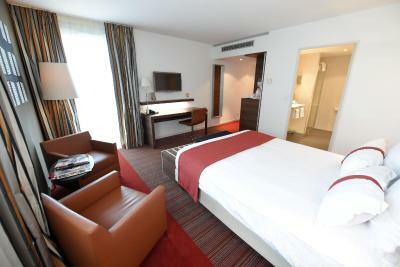 This Holiday Inn is located in Mulhouse’s Parc des Collines business district. It offers air-conditioned rooms, a sauna and indoor swimming pool. Free public parking and free Wi-Fi are available. 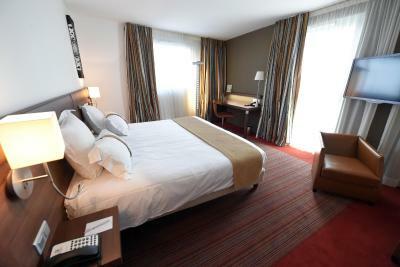 The soundproofed rooms at Holiday Inn Mulhouse are equipped with satellite TV, a telephone and private bathroom. 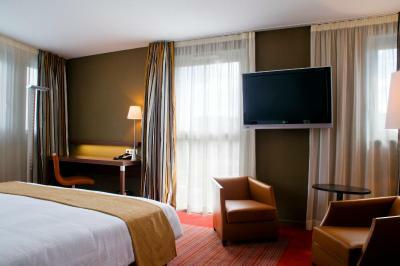 The rooms are accessible by elevator, and room service is available. Holiday Inn Mulhouse serves a buffet breakfast each morning. Guests can enjoy traditional French and Alsatian cuisine for lunch and dinner, in Brasserie Flo located in the hotel. Le Trident, the hotel bar, serves a variety of drinks and cocktails and features a fireplace and terrace. Additional facilities include a spa, fitness room and 24-hour reception desk. Guests also have access to the hotel’s library. 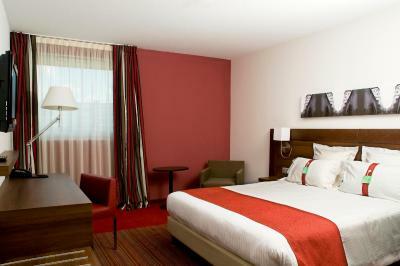 Mulhouse Holiday Inn is 22 mi from Basel-Mulhouse Airport. St. Stephen's Church and Place de la Réunion are 2.8 mi away. 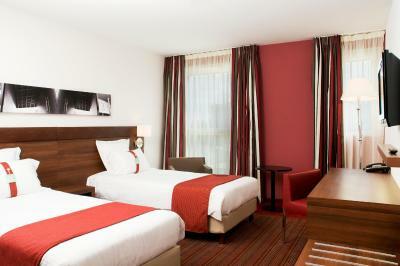 When would you like to stay at Holiday Inn Mulhouse? This room has free Wi-Fi, satellite TV and a private bathroom with a bathtub. This suite has free Wi-Fi, satellite TV and a private bathroom with a bathtub. 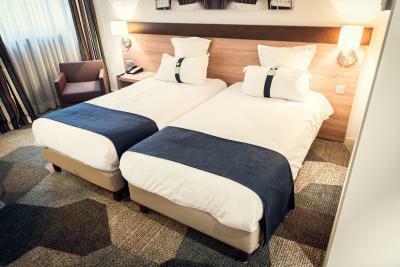 House Rules Holiday Inn Mulhouse takes special requests – add in the next step! Holiday Inn Mulhouse accepts these cards and reserves the right to temporarily hold an amount prior to arrival. The pool has no windows so it's like swimming in a cave, and the sauna and hammam were not working. Breakfast was very disappointing, hot and cold buffet with watery scrambled eggs, broiled bacon, and canned sausages - nothing freshly cooked. The cold platter was better but limited. This is the second time I have not felt politely served at the reception. At first the waitress could not find the reservation and they had doubts about my statement about the made reservation At breakfast the focus of the staff was more on the room number fixed than on the actual customer needs. Dirty plates stacked where you can expect actually clean, and rotten fruit with fruit flies and mold in the fruit basket. The only bad point is the wifi, which is quite poor and something management needs to work on, especially if they welcome a lot of people for business.